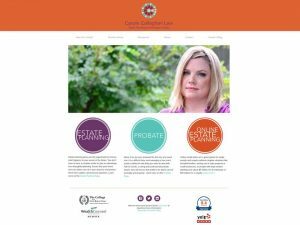 Estate and Probate Attorney Carole Callaghan wanted to offer a better alternative to online estate planning. She was bothered that many online tools for estate planning did not meet state guidelines and were not reviewed by an attorney. She knew some people turned to these sources because they didn’t want to take time out of their day or pay for an attorney to draw up the documents. But she worried that people did not know that the online tools might actually cost their families more in the long run. She wanted to offer an online option that would solve both problems. Because of our reputation for developing online applications, she asked Standard Beagle to develop a tool that would allow people to set up an estate plan conveniently. She also wanted to make sure the tool made it easy for her to review and prepare the documents for each client. 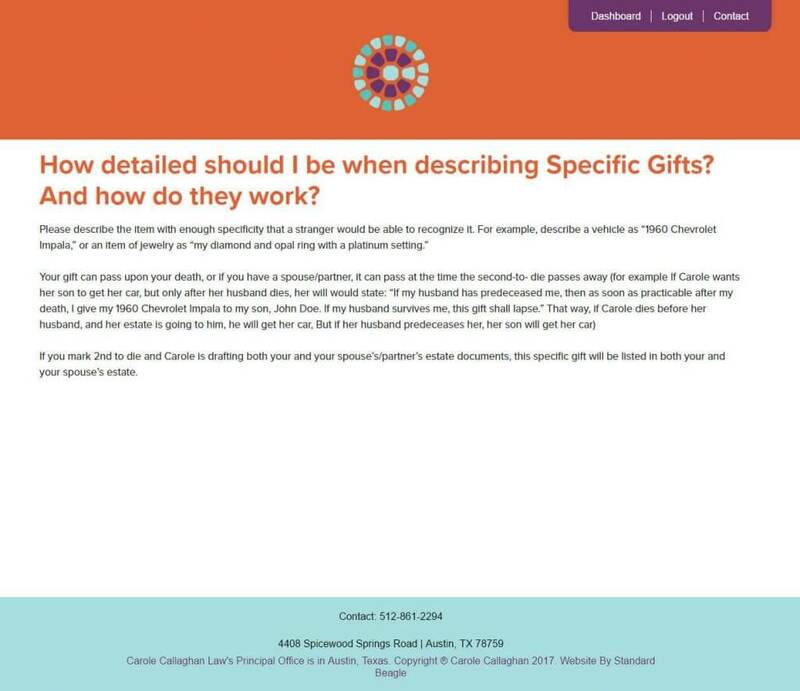 Carole had a questionnaire – several pages long – that she typically gave to clients in their initial consultation for an estate plan. 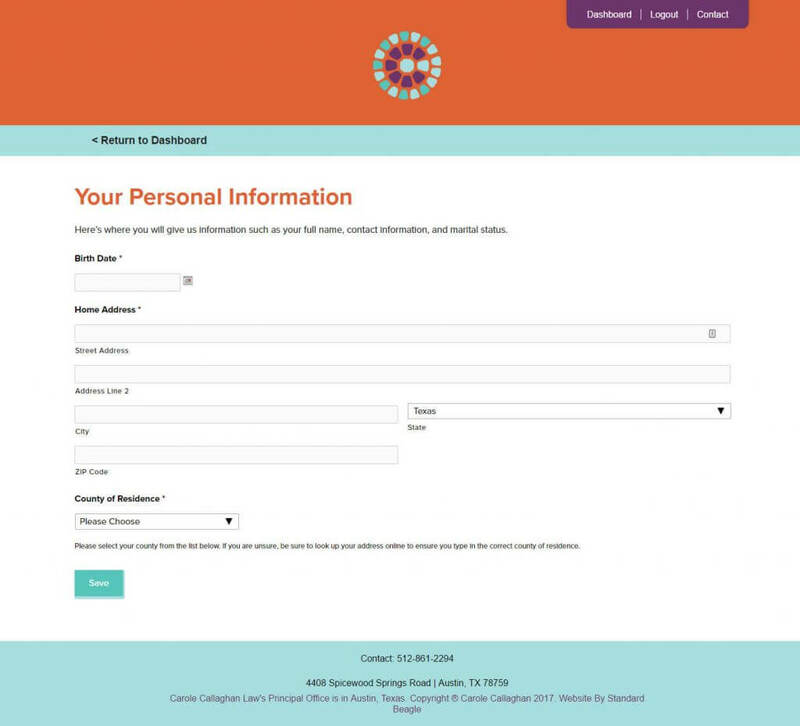 We needed to take that form and turn it into a digital tool that kept track of the information and was easy to use. The form had multiple sections, and some of the questions differed, depending on whether the estate plan was for an individual or couple. 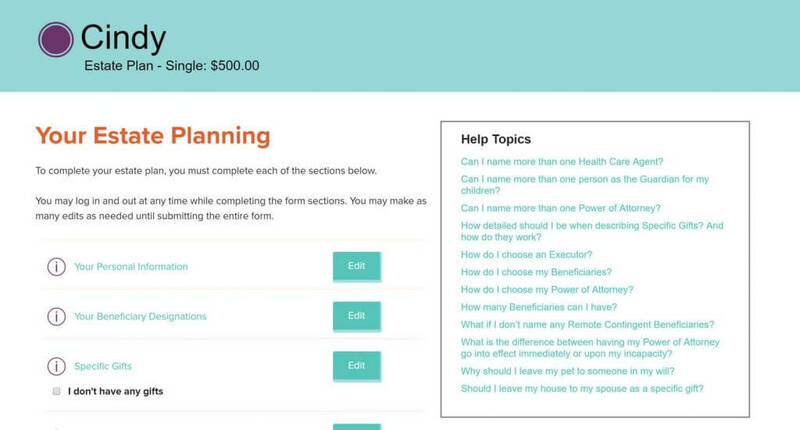 Some questions also allowed users to add multiple names to their plan, including power of attorney, health agent, and children. Carole felt strongly that users who had children should have guardianship documents, and her online tool should be no different. That added complexity to the tool to add conditional requirements and sections if users answered a certain way. The tool, despite its complexity, needed to feel seamless with Carole’s main site. 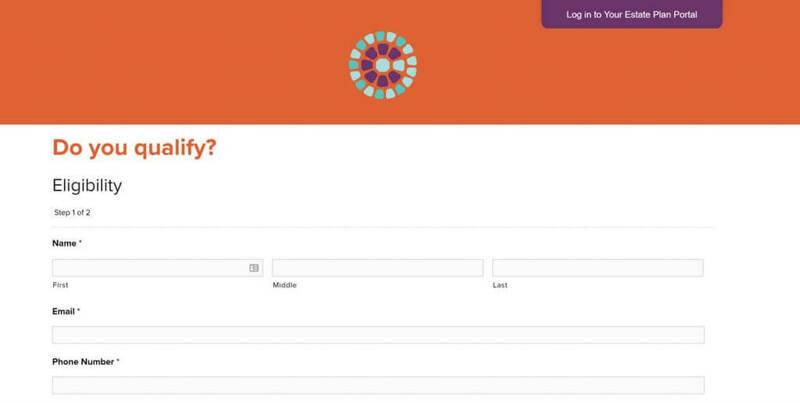 Users would find the tool through her public facing site. We developed a look and feel using the strong brand Carole had created. We integrated her logo, color palette and chosen font. Lawyers need to review all materials published on their website, so Carole either wrote or edited all content, while we focused on functionality. To reduce the overall cost of development, we implemented the site using WordPress. The blogging platform was heavily customized to make use of multiple post types and control the input and display of data. Custom functionality was added to the Gravity Forms plugin for WordPress to allow users to enter information and conditionally affect other forms in their dashboard. The complexity of the tool required extensive testing to ensure that all features worked well together. The tool barely resembled a WordPress site anymore. We had stripped it and rebuilt it to the point where if acted more like custom software. As a result, we needed to make sure our code was high quality and able to handle any situation. We spent weeks testing and retesting features to make sure the tool was high quality before launch. After the launch of the tool, we continued to watch and make small improvements over time. One of the dangers of custom software is building too much too soon. While vision is important, software should be built for the needs of the user at the time. We approached development of the tool with this mindset, and we continue to make incremental changes as needed. Momentum is growing for the tool. Carole is able to review and prepare all documents for her clients, and she has been able to reduce the amount of time needed. Feedback from her customers has also been positive. Our client feels the tool is successful and continues to market it to users who would benefit from using it. Standard Beagle is truly a first class web design service. 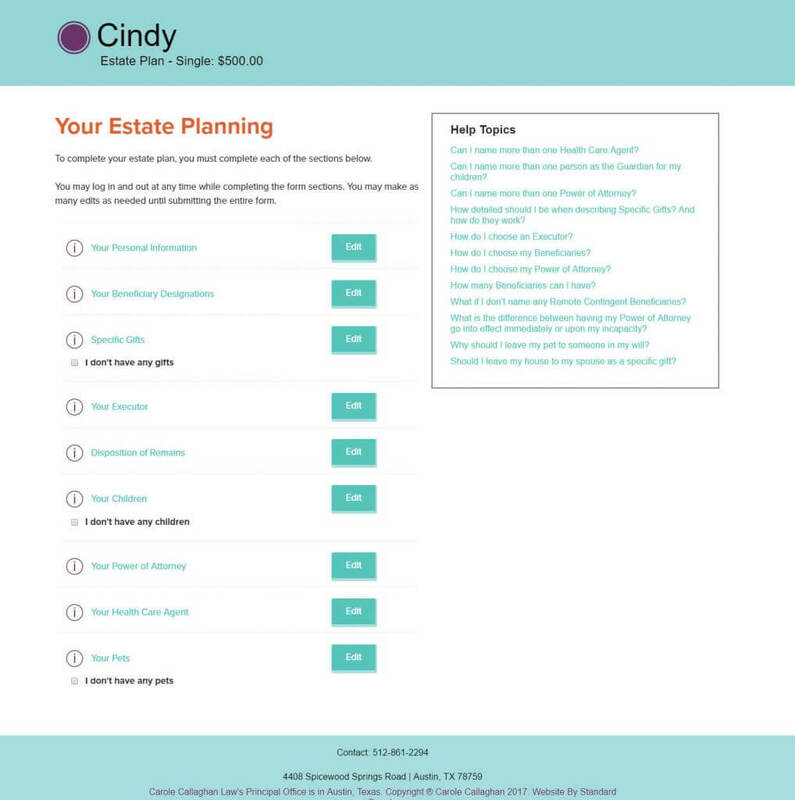 I recently had them take on the huge project of creating an online estate planning system for my business. They did a fantastic job, stayed on time, and stayed on budget! It was a pleasure working with them; they gave me regular updates and worked with me to make changes as we went along. I highly recommend their work!